Heat oven to 425°F. Place 1 pie crust in ungreased 9-inch glass pie plate. Trim excess dough from edge of pie plate; reserve excess dough. In large bowl, mix apricots, granulated sugar, flour, ginger and cinnamon. 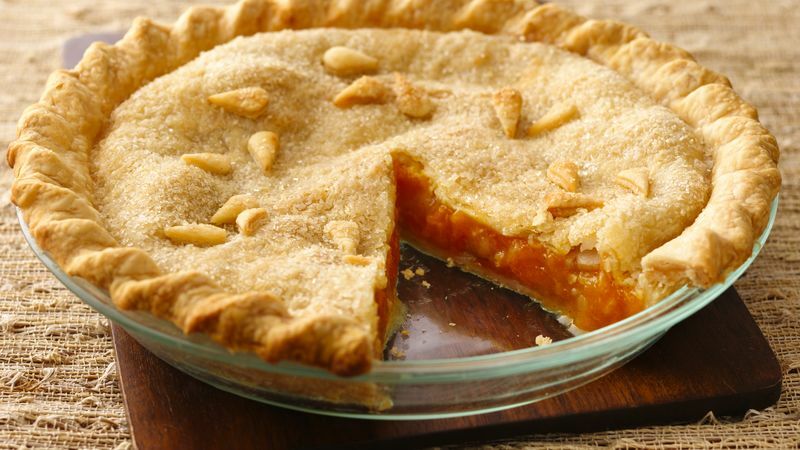 Fill pastry-lined pie plate with apricot mixture. Dot with butter. Top with second crust. Wrap excess top crust under bottom crust edge. Cut slits in several places in top crust to allow steam to escape. If desired, use reserved dough to create shapes (leaves, flower petals etc.) to decorate top of pie. Lightly brush top of pie with water. Sprinkle with turbinado (raw) sugar. Bake 40 to 45 minutes. After 20 minutes, cover edge of crust with 2- to 3-inch wide strips of foil to prevent excessive browning. To serve, top each slice with a dollop of fresh whipped cream sprinkled lightly with ginger.